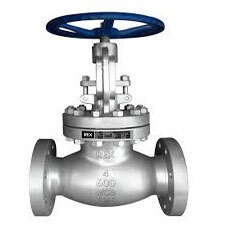 AMTECH has Globe Valves of sizes 1/2"(12 mm) to 14" (400 mm) in 150#,300#,600# casted/forged valves in standard body materials, standard seat and seal materials. Globe & gate valves can be available with extended spindle and conventional port, body and bonnet shall be bolted bonnet type and also hermetically sealed with stellited seats. AMTECH manufacturers of bellows seal valves for special applications. AMTECH Globe valves are most suitable for boiler plants services, continuous process plants ,cryogenic applications and space research institutes and acid plants, power and utility boilers, co-generation systems ,chemical recovery boilers ,wood-fired boilers, solid waste fuel-firing systems, circulating fluidized bed (CFB) boilers, Industrial waste recovery and incineration plants. SEAT	 SS 410/ SS 304/ SS316/SS 304L/SS316 asrequired compatible with body material. DISC SS 410/ SS 304/ SS316/SS 304L/SS316 asrequired compatible with body material. SPINDLE NUT	 AISI 410/AISI 304/AISI 316 as requiredcompatible with body material. SPINDLE AISI 410/AISI 304/AISI 316 as requiredcompatible with body material. SEAT:800 PSIG (55KG /CM2)FORASA 600#HYD-TEST PRESS.